Make your way to the Imperial Forums, especially Trajan’s markets which is the first “multi-level shopping mall” in the world. You can also explore the Via Biberatica, which is the most intact ancient Roman street in the city. Wander over the Roman Forum and take in the iconic views! After exploring the forum, and wandering the streets that Julius Caesar once did, climb up to see the ruins of the imperial palaces on the Palatine Hill. Enjoy the beautiful garden areas and fragments of ancient villas. Take the southeast entrance from the Roman Forum, and walk right up to the Colosseum. It is such an amazing sight to see, and if you are really interested in exploring the inside, join a tour. The tours can be expensive and have quite a bit of a wait, so decide if it is something that is really important to you! Next to the Colosseum is the Arch of Constantine, one of the largest of Rome’s ancient triumphal arches. The arch celebrates Emperor Constantine the Great’s victory and the battle that made Christianity the religion of Rome. Make sure that before sunset you slip around the back side of the central building in Piazza del Campidoglio, on top of Capitoline Hill. You’ll see a beautiful panorama of the Forum from above, with the Palatine Hill and the Colosseum in the background. One of the oldest and most famous cappuccino and espresso shops in Rome, Caffé Sant’Eustachio is famous for its home-roast beans, blended with water from an ancient aqueduct. You will find authentic, Italian coffee and some colorful characters! Definitely a sight you CANNOT miss in Rome, the Pantheon is the only ancient Roman temple to survive the millennia virtually intact. The architecture will blow your mind, and you will need a few minutes just to sit in the piazza and take in the stately sight before heading inside. Make your way north to Piazza del Popolo, and if it interests you, check out the fabulous church of Santa Maria del Popolo. Adjacent to the Piazza del Popolo, you’ll find the grounds of Villa Borghese. Stop at the east end for great views over the city and epic photo opportunities. You can sit and people watch from the lively and iconic Spanish Steps before grabbing some gelato and taking a walk down Via dei Condotti and the surrounding streets to do a little window shopping. No trip to Rome would be complete without seeing the Trevi Fountain! The tradition is to toss a few coins in, to ensure that one day you’ll return to the Eternal City. Wake up bright and early so that you beat the tour buses to the spectacular, St. Peter’s Basilica, which opens at 7 am. If you are interested, following the basilica, climb the “cupola” for a workout and breathtaking panoramic views of the city across the river. Once you’re finished, spend some time in St. Peter’s Square out front, and visit the world-famous Vatican Museums, which open at 9 am, if you want to check out history at its finest. You can expect to spend most of the day at the Vatican if you’re a history lover! Back across the river, and home to Bernini fountains, cafés, colorful street performers, and large crowds, Rome’s famous Piazza Navona is a lively place to people watch and enjoy your daily gelato. 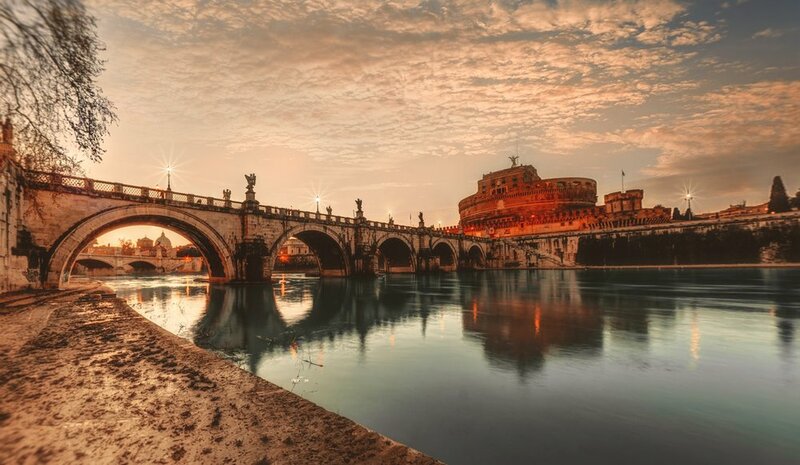 As with all first-time visits to a city, allow lots of free time to get lost and discover unsuspected treasures around Rome. Keep a map handy, but try walking around without a plan or destination. You never know what you’ll find!